The wheels are coming off this workout. The repeats are strained and the rhythm feels wrong. There’s a sense of discomfort, absent any visible pain; drudgery played out in 40-second increments, three-hundred torpid meters at a time. There is no pop to the legs, no pop in the stride. No pop, period. 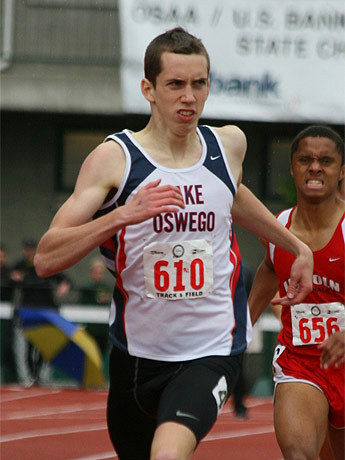 Elijah Greer, a senior at Lake Oswego High School outside Portland, Oregon, and the top returning prep 800-meter runner in the land, jogs gamely toward the start of another interval. Obscured behind a shaggy mop of brown hair is a brow etched with frustration. It is late March at the Duniway Track near downtown Portland. With Greer and the rest of his Lake Oswego schoolmates on spring break, he’s made arrangements to meet his coach, Lake Oswego assistant Bob Williams, and a small group of others at this community track for a late afternoon workout designed to improve speed and sprinting form. 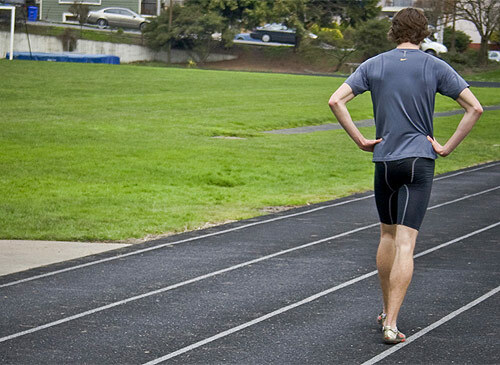 The plan calls for repeat 150’s and 300’s at a sharp, controlled pace, followed by short, explosive hill repeats, all with specific focus on late-race arm action and opening his hips during the drive to the finish. To help with the effort, Williams has recruited local speed and strength coach Askia Brown, a former assistant to the track team at nearby Central Catholic High. 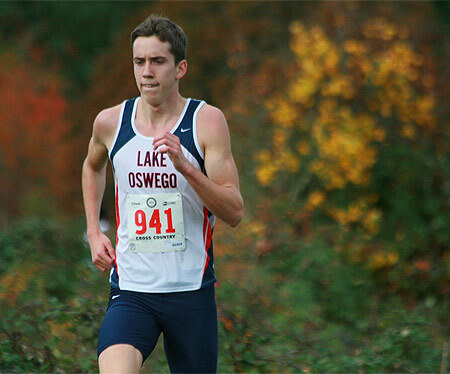 Greer’s Lake Oswego teammate, James Ratliff, a state runner-up in the 110-meter hurdles, has agreed to accompany him on the repeats, but inevitably lags behind the smooth-striding half miler. The sky is overcast and chilly, the day struggling to reach the 60-degrees promised by the weatherman. Greer, by contrast, is lanky and languid. He is confident without seeming cocky. Reticent without being taciturn. If you happened upon him in the school hallway wearing a hoodie and a backpack, you’d never suspect you’d encountered the fourth-best prep 800-meter runner in history. At the afternoon workout, the only indication you’re watching an athlete more gifted than your average high school runner is the Team USA shorts he wears over a pair of compression half-tights—leftover gear from his foray to the World Junior Championships in Poland last summer, where he made the semifinals of the 800 in a field fronted by 1:42 800 talent Abubaker Kaki of Sudan. A set of 300’s and 150’s, for this kid? A guy who dropped a 1:47 800 as a junior? The best high school two-lapper the US has seen in years? This workout should be a slam dunk for Greer, a softball pitch of an afternoon. But it isn’t. Nothing is coming easily today. When Elijah Greer ran 1:47.68 to win the 800 finals at the 2008 USATF Junior Nationals, simultaneously becoming the junior class record holder and #4 all-time in the event, it was at the tail-end of a weekend which saw him slash nearly 3 seconds from the PR of 1:50.31 he carried into the meet. That “leap” propelled him all the way to Bydgoszcz, Poland, for the World Junior Championships, where expectations were high for the latest American mid-distance hope. Reality for Greer, however, lingered slightly closer to the ground. After an opening round of 1:50.73 saw him advance to the semifinals, he ran 1:50.47 in the semis to finish a non-qualifying sixth, both times well-shy of his Junior Nationals breakthrough. Asked whether the experience left him hungry for more international racing, his response is measured. While not exactly at odds with his prodigious talent, Greer also hasn’t been entirely comfortable with the mantle of high school distance hero. He is both aware of his gifts and adamant they occupy the proper place in his life. When he first began in the sport, he acknowledges that even the fun part was up for debate. He got his start running cross country on his middle school team, and his talent was evident from the beginning. After winning the first race he entered, it wasn’t long before kids on the team began comparing him to a certain Oregon icon whose legacy is inevitably thrust upon every male harrier with promise coming up in the Beaver State. While Greer realized he could be pretty good at this running thing, he didn’t know if he wanted to be. These days he’s more at ease with what it means to be a prep star in a state where the 6A state meet is annually held on the same Hayward Field track where Steve Prefontaine made a name for himself more than forty years ago. He’s even committed to join the powerful team at the University of Oregon next fall, where he’ll continue to develop an ability that he acknowledges is part-gift, part-the product of hard work. When Greer rips through the first 150 on the Duniway track in 17.4 seconds, it is under the watchful eye of Coach Williams and the dissecting gaze of Brown, the speed specialist. The goal, says Brown, is to transform Greer into a hybrid between distance runner and sprinter, keeping his smooth arm gait in the early going of mid-distance races, but allowing him to call on the sprinter’s muscle memory when the kicking starts. Understandably, the open arm action of the sprinter in full flight doesn’t come naturally to Greer, who has ingrained the “Easy-L’s” of the cross country harrier into his running form. He has all the other components which make him formidable in races from 400- to 3000-meters—the aerobic engine, the competitiveness, the core strength, the variable leg turnover allowing him to shift gears on the final backstretch and drop his competition with alarming alacrity. The one thing missing, according to Williams, is the powerful arm drive and open hips of the sprinter. That’s what today is all about—starting to add that final piece of the puzzle. Greer shuffles back toward Williams after the initial 150. “I was trying to do that arm thing,” he says, voice betraying the fact that he’s not sure he’s fully grasped the arm thing. Williams nods, but he’s watching something else. Noticing details about his pupil’s carriage that even Greer fails to detect. After another 150 and a subsequent 300, the longtime mentor’s focus becomes clearer. Greer feels it too, though both seem loath to acknowledge it yet. He is pressing when he should be floating. Pushing when he should be purring along. Greer completes a short recovery jog and then takes off again with Ratliff in pursuit. As the pair round the turn and slip onto the backstretch, Williams glances at Brown. “Yeah,” Brown says, gaze never shifting from Greer’s churning form. When Greer passes the 200-meter mark, Williams cuts the relative silence with a sharp whistle from the far side of the track. Greer adjusts, but not enough. Track fans love matchups. Love a gritty, gutsy, dive-at-the-finish duel between two or more evenly matched opponents who’ve sought one another out for the sole purpose of meeting inside the crucible of a race. Fast times are one thing, but it's the matchup that gets the blood flowing and the message boards humming. The possibility of athletes at the height of their abilities meeting on the same starting line for a winner-take-all collision. So when Robbie Andrews of Manalapan, New Jersey, took down the national record in the indoor 800 at the National Scholastic Indoor Championships on March 14th, running 1:49.21 to record the first sub-1:50 by a prep undercover, all eyes understandably turned West to Oregon. When will Greer race Andrews? What about Zac Mellon from Minnesota? He ran 1:48 as a junior—throw him in there. Get them all on the line in a single race! The thing is—Greer isn’t necessarily wired that way. He doesn’t get pumped to race names on a national list, or to toe the line against people he is supposed to compete against. If the motivation is more intrinsic than extrinsic? If the drive to be the best and the fastest isn’t necessarily connected to someone else’s subjugation? He starts to explain his approach to racing: “Stay in my comfort zone…stay in my comfort zone…go fast,” and then interrupts himself: “Actually, don’t give away my race strategy.” As if knowing that Greer will, at some point, transition rapidly from his "comfort zone" to something he vaguely terms “fast” will be of any assistance to adversaries encountering his explosive move 600 meters into a race. But part of the reason a matchup against Andrews is such a tantalizing possibility is their similar racing styles. Both have the capacity to shift gears late in a race with precision, gapping the field with stunning and daunting immediacy. Both have the ability to leave opponents helpless in the wake of that shift. The first set of 300’s at Duniway track is supposed to be a cutdown—43-seconds, then 41, then 39. After an opening 40.9, Greer’s next repeat is 42.6. He should have been able to hit 41-seconds, but it’s not simply a matter of poor pacing. Things are going backwards. The wheels are coming off, and Williams wants to figure out why. He and Brown huddle with Greer, probing the details of the day leading up to this afternoon session. Both coaches roll their eyes. “What time did you wake up this morning?” Williams asks. “At, like, eleven,” Greer says, sheepishly. Another set of eye rolls. Spring break has its privileges. Greer, not wanting to disappoint his coach or waste the afternoon, tries one more time to push the round peg through the square hole—a final repeat fueled only by Fruit Loops. The time is even farther off the mark. When he ambles back down the homestretch toward Williams, their eyes are in agreement before their voices work out the details. Fold it up and do a cool down. This one’s over. The spring has been somewhat uneven for Elijah Greer. He opened with a 1:52.23 800 at the Linfield Icebreaker on March 7, and then followed that up two weeks later with a then-US#1 3:50.70 1500 at the Oregon Preview on March 21. In early April he ripped through a solo 1:51.47 in front of a home crowd at the Laker Classic, setting a meet record which is likely to stand for a very long time. Things seemed to be rolling. But then a planned outing in the fast section of the Men’s 800 at the Oregon Relays, with a goal time of 1:48, was scrapped after a tight hip flexor which has been plaguing him this spring flared up days before the event. Taking a conservative approach, knowing it’s a long season, Williams and Greer decided to withdraw from the meet at the last minute. Fans may have been disappointed, but Williams had no regrets. He knows that half the battle is keeping Greer healthy for the late-season efforts. For Greer, the pull back was frustrating, but he’d learned through a daunting autumn and winter of illness and lingering injury the benefits of taking the longview. His latest opportunity to do exactly that came May 9th at the Oregon Twilight meet at Hayward Field, where he ran unattached in the fast heat of the 800. Lingering near the back through the opening lap, Greer moved up gradually as the field emerged from the deep shadows of the homestretch grandstand and rounded the third turn. He shifted again on the backstretch, sharply and with purpose. That move carried him to fourth place, a position he held as the pack jostled for placing down the final stretch. He ended up fourth overall, but he crossed in 1:48.97, a time which was not only a new US#1, but also served to get the monkey of the season’s first sub-1:50 off his back. If there was any concern that his 1:47.68 from the summer was a one-time event, a fortuitous case of catching lightning in a bottle, here was the answer. Greer is well under 1:50 again, back on track and back in gear. After the premature cool down, after his sweats are on and his gear is stowed, Greer takes a seat on the spare bleachers alongside the Duniway track and reflects on the afternoon. He allows that he has a lot to learn, but that he’s getting better at knowing his body, listening to the subtle signs and taking care of the small details. All things he’s learning from Williams. Together they’ve come to know what works for Elijah Greer, and what doesn’t. When to pull back and when to push. When to run hard and when to simply walk away. They tinker until they get it right. Undoubtedly, there will still be days of sleeping in, and menus that consist solely of Fruit Loops, but those days are getting fewer and farther between. On this day, on this track, growing means walking away. And even in retreat, Elijah Greer is moving forward.